Folding Gates. Single, Double & Portable Security Folding Gates. Folding gates block access to passageways and buildings without blocking ventilation or limiting visibility. Warehouses and manufacturers use folding gates to protect halls, entrances to buildings, warehouse doors, docks, and plant entrances. Schools and hospitals also use them to prevent unauthorized access to rooms and offices. Residences and commercial office parks can also benefits from folding gates when extra security measures are desired and determined appropriate. The classic folding gate is designed like an interlocking lattice of steel, and is riveted back to back to provide a sturdy barrier against intrusion and to withstand exposure to environmental elements. Typical sizes offered by Easy Rack from 4-1/2' wide by 5-1/2' high single gates to 16' wide by 8-1/2' high double gates. Folding gates made for door openings range between 24” to 48” wide in heights from 61” to 83”. Portable gates are available in sizes 6 and 12 feet wide. Easy Rack will also provide custom size single and double security folding gates up to 10’ high. These gates are intended to secure door openings ranging from 24" to 48" wide and 61" to 83" high. They feature a unique reversible hinge design that allows them to be mounted to either the right side or the left side of the doorway in either the casing or the face of the opening. 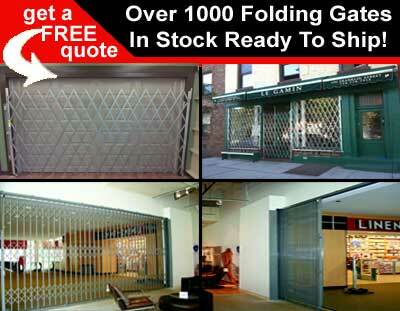 Each folding security door gate comes with a locking bar that can be secured with a padlock. When not in use, the gate will pivot 180 degrees out of the way when open. These one piece gates are intended for standard openings, patio doors, garages, and industrial and commercial entrances measuring 4-1/2' to 7-1/2' wide and up to 8' in height. Single folding gates are shipped preconfigured to lock on the left (default position), but an Easy Rack specialist can have them manufactured to lock on the right side. A ball bearing caster, welded to the lead rail of the gate, is used to aid in the extension and retraction of the gate. Like door gates, single gates will pivot 180 degrees when not in use. To compensate from the loss of structure when the gate is stretched open, a drop pin holds the center of the gate in place. These gates are ideal for protecting larger openings, overhead doors, dock doors, storefronts, and bay doors in factories and warehouses. These two-piece gates can be custom fitted to any size width, and a maximum height of 10'. Because they are Double Gates, each side will pivot 180 degrees out of the way, allowing the gates to be used with dock and overhead doors in industrial facilities that need an unobstructed passage for vehicles and material handling equipment to pass through. These gates are often used in public schools and hospitals to seal off hallways, cafeteria areas, and sensitive areas within the building. They feature a two piece design consisting of dual 6’ X 6.5’ sections. They are easy to install because they are designed to pass through standard door heights and be can be rolled up for convenient storage. For extremely large entrances or hallways, additional 6’ sections can be added on. Easy Rack carries a wide variety of used pallet racks, commercial shelving, material handling equipment, and modular prefab buildings installed nationwide. If you can not find what you are looking for call us toll free at 1-888-776-3720 and we will find it for you. Our home office is located in Houston, Texas with warehouses located throughout the United States that enable us to service all 50 states including New York NY, Los Angeles CA, Miami, FL. Chicago, IL. Denver CO., New Orleans, La., Cleveland, Ohio, Kansas City, Mo., Mesa, Arizona, Virginia Beach, Va., Omaha, Nebraska, Oakland, California, Miami, Florida, Tulsa, Oklahoma, Minneapolis, Minnesota, Colorado Springs, Colorado, Arlington, Texas, Beaumont, Texas, Denton, TX, McKinney, Texas, Midland, TX, Killeen, Texas, Dallas TX, San Antonio, TX, Austin, TX, ALBQ, NYC, LA, MPLS. We installed several of your safety mirrors in the corridors ..